It is always a problem for parents to find a baby outfit. And if you run a kids clothes store you can help them to find proper products. All you need is a good e-commerce website. And we are here to cover you. 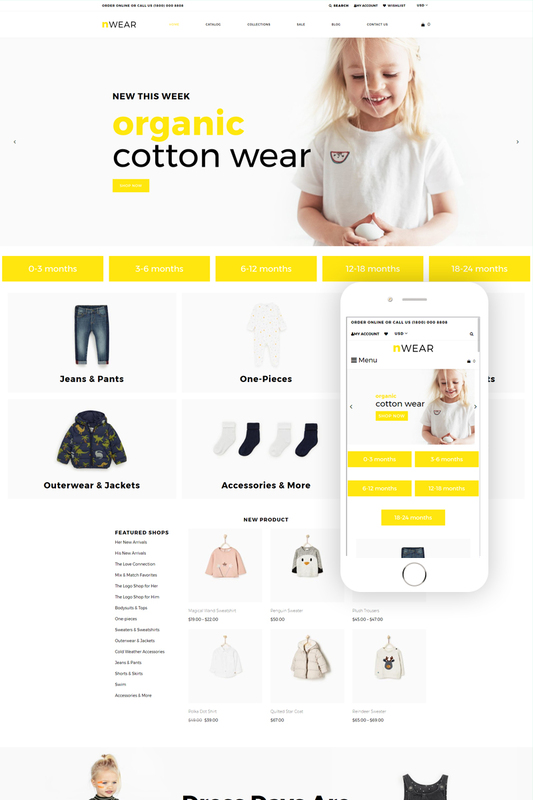 Our developers created a top-notch website template for clothing stores. nWear has a clean design that allows you to highlight your products and accent attention on the most important information. It has a blog and you can use it to inform visitors about the latest news. It also has social options to keep in touch with clients. And if you want to sort the products you can use the catalog, sale and collections category pages. nWear supports high-quality images, has impressive effects and will be a reliable tool for product advertising.